The Honda Accord Crosstour has ended its boring striptease, revealing an Accord-like front with a muscular grille and an interestingly designed hatch. They haven't yet shared a picture of the vehicle with the hatch open, but it appears to slope forward allowing a larger opening than a less-streamlined rear. In fact, it's possible the rear hatch opens in two pieces, with the top opening upwards and the bottom section either opening up by the bottom or side. Whichever way it opens, the new Crosstour is certainly more shapely than the base model Accord. Frankly, we're just happy to hear the Crosstour will sit atop the Accord family. We mean, it is the big boy in the family, isn't it? TORRANCE, Calif., Sept. 1, 2009 - The all-new 2010 Honda Accord Crosstour evolves the Crossover Utility Vehicle (CUV) concept by integrating a sleek and aerodynamic shape that blends sporty, low-profile contours with versatile CUV functionality, American Honda Motor Co., Inc., announced today. "Our concept is to broaden the appeal of the Accord line-up by leveraging traditional Accord strengths of fun-to-drive performance and handling while also adapting to dramatic shifts in the light truck marketplace," said Erik Berkman, vice president of American Honda Motor Co., Inc. "The Accord Crosstour accomplishes that by offering a modern interpretation of a CUV while integrating the refinement and efficiency of a premium sedan." Derived from the Accord Sedan, the Accord Crosstour maximizes car-like ride and refinement, yet maintains capabilities consistent with a CUV's increased ride height and all-weather potential. The Accord Crosstour's styling builds on the Accord's familiar character lines and adds a bolder front grille complemented by a durable lower-body appearance, wedge-shaped C-pillars and an aggressive rear stance. The flowing roofline narrows smoothly into the rear of the vehicle to create an aggressive-looking design, which conceals a unique cargo area that can adapt to large objects that exceed the capacity of a sedan. "We know SUV buyers like the commanding view of the road that comes with a high eye-point and like the comforts of living with an SUV," said Berkman. "This vehicle meets the needs of buyers looking for those attributes yet at the same time want an image that is different from a conventional SUV." 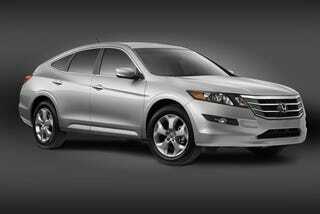 The Accord Crosstour will be positioned at the top of the Accord family when it goes on sale in fall 2009. Additional details will be announced later in the year. Consumer information is available at automobiles.honda.com/future-cars. An Accord Crosstour Facebook page is available at www.facebook.com/accordcrosstour. Additional media information regarding all Honda products is available at www.hondanews.com.